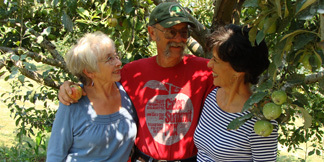 Joanie Cooper, Shaun Shepherd and Franki Baccellieri met through the Home Orchard Society(HOS). They worked together on the HOS board for many years and developed a fast friendship. They traveled around Oregon collecting scions and fruit for events and exploring old orchards. Shaun, Joanie and Franki shared a passion for preserving the heirloom varieties of tree fruit and vowed to make the dream a reality. The impending loss of the Botner orchard and other homestead orchards was the impetus for the Temperate Orchard Conservancy. Saving these varieties became critical to the three of them. In January of 2011, collecting scions and grafting the apple trees began. In March 2012 TOC was officially established as a 501(c)3 Oregon nonprofit organization. The connection and shared passion of the TOC founders has brought them to Almaty Farm. Joanie had the first vision, and she possesses knowledge of farm structure, its needs and workflow. Shaun is experienced in propagation and has a great aptitude for classical mechanics. Franki's expertise is in administration, management and planning. Together the three have found a balance. Their distinct talents and individual gifts make a complementary working team. Joanie Cooper has had a garden every place she lived. 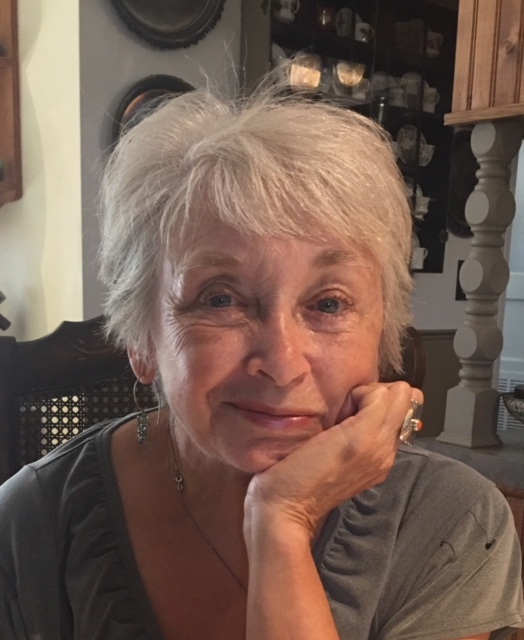 As a little girl, she loved shelling fresh picked peas on her Grandma's porch and running down to the pasture to feed Northern Spy apples to the cows. She was the happiest when outside with the blooming flowers, sprouting vegetables and many fruit trees. Animals, big and small, have surrounded Joanie always. In 1986, Joanie purchased a 50–acre farm on the outskirts of Amity, Oregon. The farm and her activities in Yamhill County introduced her to Home Orchard Society. Through HOS, she met the love of her life and married Keith Cooper. She and Keith enjoyed living the country life and working together for many wonderful years. The Amity farm housed the remnants of a pioneer orchard planted in the late 1800's. This orchard sparked Joanie's interest in old orchards and heirloom apples. She loves to read and truly enjoys the diligent perusal of old books and publications researching old apple varieties. She considers the many hours spent working on the Apple Identification Team a favorite pastime. Finding a way to preserve this shrinking heritage was her vision and ultimately became the Temperate Orchard Conservancy. Shaun Shepherd grew up in the desert country of Christmas Valley, Oregon. (Not the home of many fruit trees.) He moved to Portland with his family when he was 12. He has three children, and his three grandchildren think it great fun to "help" Grandpa inside and out. 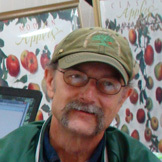 The first event Shaun attended as a Home Orchard Society member in 1996 was a potluck picnic in Newberg where he immediately connected with Wayne Huffstutter, the head of the Apple Identification Team. That meeting was a meeting of the like–minded if there ever was one. Wayne started Shaun on a never–look–back exploration of fruit trees, and Wayne's passion was contagious. Shaun has carried on and become the head of the Apple ID Team since Wayne's death in 2009. Shaun has also become an expert hard cider maker. He generously shares his outstanding cider with friends and family and continues to expand his expertise and knowledge of apples and cider making. 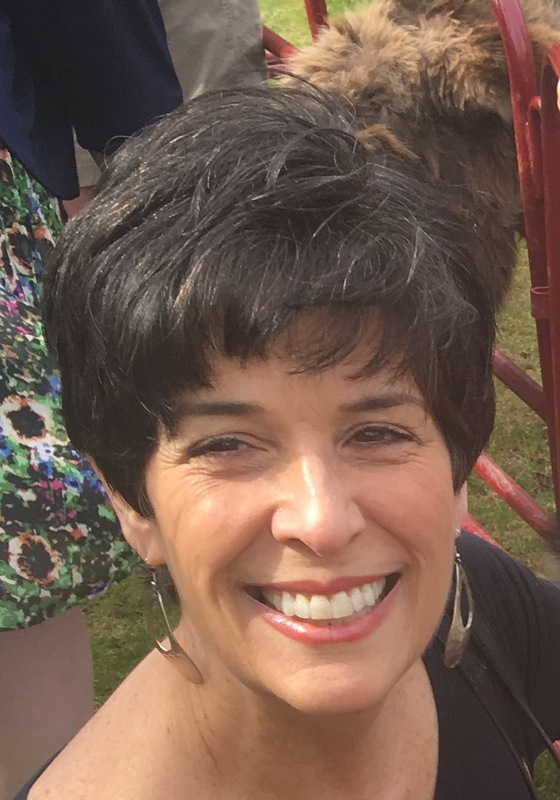 Franki Baccellieri is a first generation Italian American who grew up on Tigard's Bull Mountain when very few families lived there. She loved exploring the great open spaces on her horse with her dog trotting alongside. After college, she lived in the south of France for many years and raised her two children there before moving back home in 1988. Franki's passion is her garden. She loves to experiment espaliering different fruit tree varieties, and grows about 40 fruit trees and numerous berries and herbs on her one–third acre city lot. Flowers bloom every day of the year in her yard, attracting bees, birds, bugs and other critters. She enjoys preserving her fruits, making jams and jellies, tomato sauce and pesto and sharing it with her family and friends. She is secretly praying for a grandchild with whom she plans on sharing her love of the soil.